I have a lot of friends in the paleo community, and they have been buying Instant Pots left and right. I finally joined the bandwagon this January, and I admit it – I'm smitten. I feel about this Instant Pot the way I used to feel about my Kitchenaid Mixer (remember those pre-paleo baking days?). It just makes life so much easier! The Instant Pot is many kitchen appliances in one. It's a slow cooker, a pressure cooker, a rice cooker, a yogurt maker, and it even has a sauté function where you can brown meat before cooking it for added flavor. How impressive is that? But if you only use it to make your weekly bone broth, your world is still going to be rocked. Why? It makes 24-hour broth in just 2-1/2 hours. If you're new to the Instant Pot, listen to Episode 55 of the Phoenix Helix podcast for tips from the experts. What are the benefits of bone broth? 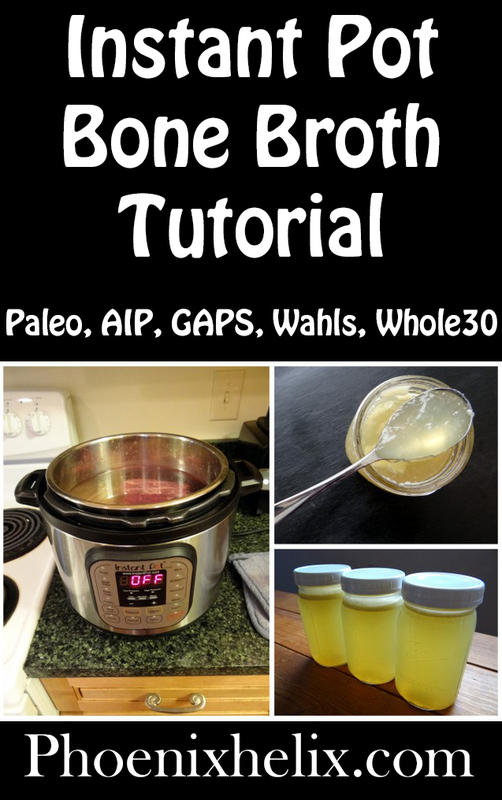 When you simmer the bones, you release a lot of nutrition into the broth, including: marrow, collagen, gelatin, glycine, proline, hyaluronic acid, chondroitin sulfate, calcium, phosphorus, magnesium, and potassium. There's a reason many of these items are sold in supplement bottles in the health food store. They're building blocks for your body, and they're especially beneficial for reducing inflammation and helping our bodies heal. For details, check out this post from Marks Daily Apple and this one from The Paleo Mom. What bones should I use? Bones in general contain a lot of nutrition, so you have a lot of options. You can simply save bones from your other meals. Put them in a container in the freezer, and once you have 3 pounds, make some broth. It's fine to mix up the bones of different animals. If you're buying bones, I recommend a variety of (1) marrow bones, which are sometimes called pet bones in the grocery store, (2) meaty bones, which give the broth a nice flavor, and (3) gelatinous bones, like oxtail, pig/beef/chicken feet, or knuckle bones. Whatever you choose, I do recommend seeking out organic bones if you can. You don't want toxins in your bone broth. How do I make it gel? I'm going to let you in on a little secret. Even if your broth isn't jiggly, it doesn't mean there's no gelatin in it. It just means it's not so concentrated that you can see it. The amount of gelatin is related to 2 things: (1) the bones you choose, and (2) the amount of water you use. I mention above that some bones are more gelatinous than others, so if you want a thick broth, be sure to include some of them in every batch of broth. In my experiments, I've found that adding a pig's foot makes the most gelatinous broth. The second factor is water. If you have too much water compared to bones, your broth will be diluted. The pressure cooker doesn't let water out of the pot, whereas slow cookers and stove top pots do (automatically concentrating the broth). If you don't choose highly gelatinous bones, reduce the water. 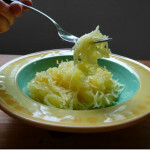 That said, remember this: gelatin is just one of the many healing ingredients in bone broth. For example, marrow bones have almost no gelatin, but they have tons of marrow (also a superfood). So don't worry too much about the thickness of your broth. It's nourishing, no matter what. Where can I buy bones? Try your local farmers, the meat counter of your grocery store, Asian markets, and you can also find bones online. One vendor I trust is US Wellness. 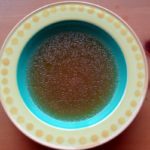 Is it true that Instant Pot bone broth is lower in histamines? While no scientific studies have been done, many people on a low-histamine diet say they can tolerate pressure cooked broth, where they can't tolerate slow-cooked broth. 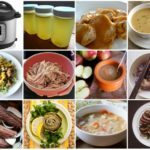 How I can make broth without an Instant pot? I made broth on the stove for 2 years. It's easy to do; it just takes longer. 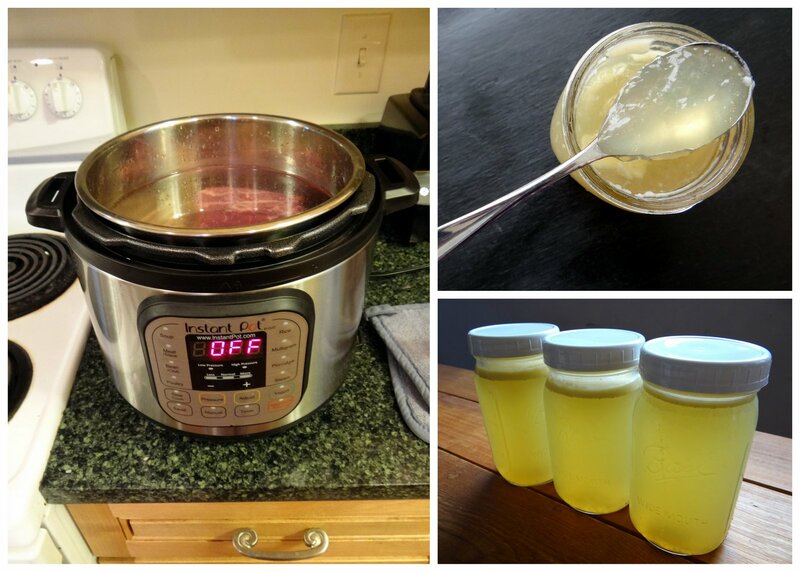 You can find my 24-hour bone broth recipe here. How do I drink it? I like the flavor of bone broth, so I drink a cup with dinner every night. Sometimes I'll add some minced garlic for its nutritional benefit. Sometimes I'll stir in a raw egg yolk, which I've been able to reintroduce successfully. Sometimes I'll add some fresh herbs. However, if you don't like drinking broth straight-up, use it as a base for soups. Here's an AIP-Friendly Soup Recipe Roundup. This recipe was written for the 7-in-1 6-Quart Instant Pot (the most popular model). Generally speaking, Instant Pots behave similarly from model to model. But if you have a different model, you may have to adapt the instructions slightly. If yours is the larger 8-quart model, you can either increase the ingredients by 1/3 or decrease the amount of water you add to the pot. You may have noticed the vegetables in this recipe are much smaller than used in a traditional bone broth recipe. This is because the pressure cooker infuses the broth with the vegetable flavor. I found that if I added full sized vegetables, the flavor was too strong. Some people wait and add full-size vegetables during the last 30 minutes of cooking, but this requires depressurizing and repressurizing the Instant Pot. I'm all about “easy” cooking, and in my experiments this recipe achieves the same flavor without that extra step. If your Instant Pot is new, wash it well prior to use. Be sure the gasket/sealing ring is in place on the cover. Lock the cover in place on the pot. Turn the pressure knob to the “Sealing” position (the knob will stay loose, but it does need to point in the right direction). Press the manual button once. You'll see the display light up to indicate high pressure 30 minutes. Press the + button until it reaches 120. Wait 5 seconds, and the pot will beep and the display will say ON. This means it's heating up and building up pressure, which takes about 30 minutes. Once full pressure is reached, the display will switch and start counting down from 120. Update: If you bought your Instant Pot in 2018 or later, they updated their display panel. The “manual” button is now called “pressure cook” – this is the button you'll press. When the broth is done, the Instant Pot will beep and the display will switch to L0:00. This is the default “keep warm” setting, and the clock lets you know how long it's been kept warm (up to 10 hours). At this point, you can let it naturally depressurize, by leaving it alone for about another hour. Or you can quick-release the pressure, by turning the pressure knob to the “Venting” position. Be careful – when you do this, hot steam is going to come out of that knob. Just be sure to keep your hands and body clear, and turn the knob just slightly at first. As more pressure is released, you can turn it completely into the venting position, and you'll feel the knob lift up. Once all the steam is released, you can open the pot. A safety measure on the pot is that the lid is pretty much impossible to turn, when it's still under pressure. Use a slotted spoon to remove the bones, meat and vegetables. Throw away the meat and vegetables, but you can freeze the leftover bones and re-use them in your next batch of bone broth. Just be sure you always add at least some new meaty/gelatinous bones to each batch. Pour the broth through a mesh strainer into a large bowl. I usually let it sit for 15 minutes or so, so any particles in the broth sink to the bottom of the bowl. I then transfer the broth into mason jars and pour out the last cup (with the particles). Those particles aren't harmful; they're just parts of the meat and bones that the strainer didn't catch. I just like a “prettier” clear broth. Let mason jars cool for one hour on the counter, and then refrigerate. If there's a solid layer of fat on top of the jars, they work like a protective seal, and you can keep the broth in the fridge for weeks. However, if you only have a thin layer of fat, or the fat is cracked, keep the broth in the fridge a maximum of 5 days. You can also freeze broth for up to 6 months. Just let it cool completely in the fridge; then transfer to freezer-safe containers. Mason jars can crack in the freezer, especially the larger sizes. Personally, when freezing broth, I use glasslock instead. 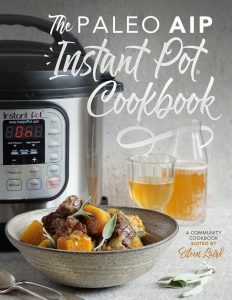 The Paleo AIP Instant Pot Cookbook.